Kadambini Ganguly, India’s first lady doctor was an extraordinary, progressive woman who championed women’s rights. This extraordinary woman has many firsts to her credit. 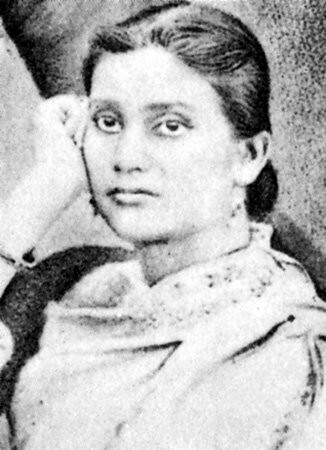 She was one of the two first women graduates of India, among the first to pursue medicine as a subject, and the first woman to qualify as a Graduate of Bengal Medical College (GBMC) in 1886. What makes her achievement noteworthy is the fact that she was married when she began her medical education, and had to mother at least five children from her husband’s previous marriage! Kadambini was also among the early Indian women to ‘cross the seas’ to Europe in 1892 to pursue higher studies. She returned with three advanced degrees in medicine and surgery to become the leading woman practitioner of Hippocratic medicine in the Asian subcontinent. Healing was not her only forte. Kadambini was a prominent espouse for women reforms and emancipation. She was also the first woman to address an open session of the Indian National Congress in 1890. Kadambini’s bio would be incomplete without the mention of the seminal role two men played in her life – father Braja Kishore Basu and spouse Dwarkanath Ganguly. Both were liberated Brahmo Samajists and ardent champions of female education. Why we find her inspiring? We need such leaders within the political realm as well! can anyone please give me information about where did kadambini ganguly stayed in kolkata? She’s always being an inspiring, towering figure and personality in young Bengal who relentlessly worked toward women’s progress, enlightenment, education, and renaissance of Indian women. A frontrunner in progressive spirit, and being a role model for women’s education throughout India, and perhaps first in Asia, she had crossed all the barriers which hitherto prevented contemporary women of India confined within conservative echelon to rise up, and take up technical education in India.